Last year in December Tracey Kershaw organised and ran a Critique Group Session at Backlit, an artist community in Nottingham. I had just become an associate member and signed up for the session to get to know some of the other artists, and this is how I first met her. I came a bit early (with enough time to set up my copy of 346), and was greeted by an energetic woman in overall jeans with blue strands in her black hair. She was busy preparing the event, cooking tea and finding small bits and bops to get everything perfect, but nevertheless when I arrived, she had time, was interested in what piece I brought. Not knowing anyone I had been a nervous about coming there, and she managed to put me at ease immediately and made me feel very welcome. I think, this is her special gift: she made everyone feel welcome and relaxed; her abilities as a host made this a great meeting for everyone. And the more I got to know about her in the months that followed, the more impressed and fascinated I am by this woman and her work: Let me show you some of it! So much speaks from such a short sentence. 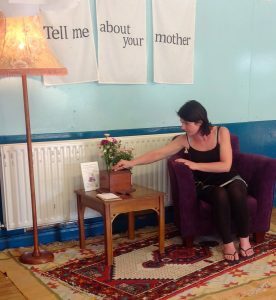 I only slowly understood that the statements on the bowls are not Tracey’s words about her own mother, but statements which she collected and curated for different projects over the years: She has this performative installation with a wonderful living room lamp, a dark purple plush comfy chair on a worn-out carpet – and a letter box. She invites visitors to sit on the chair, and talk/write/or reminisce about their mothers. 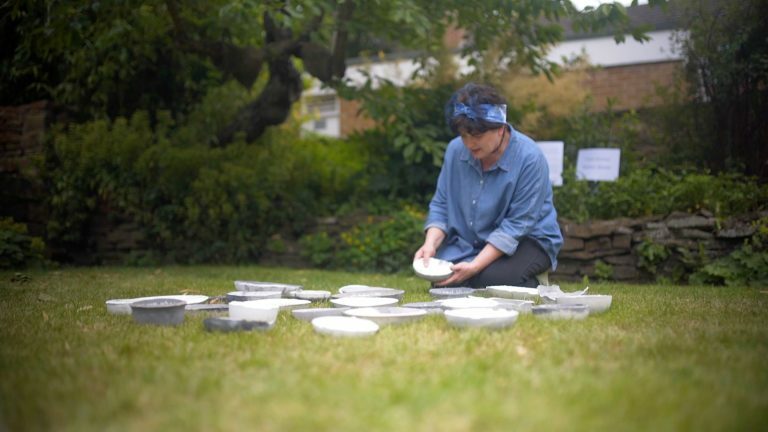 She selects statements from hundreds of handwritten notes that she collected and copies not only the words but also immitates the handwriting – on concrete! And it’s amazing how well she manages to do it. This gives them a whole new layer of personality and adds vibrance. The earthy colours (she uses grey, brownish and black concrete), the handwriting on it, and the cracks and faults of such a bowl in your hands all together give this loose collection of words about women a physical presence in the world. 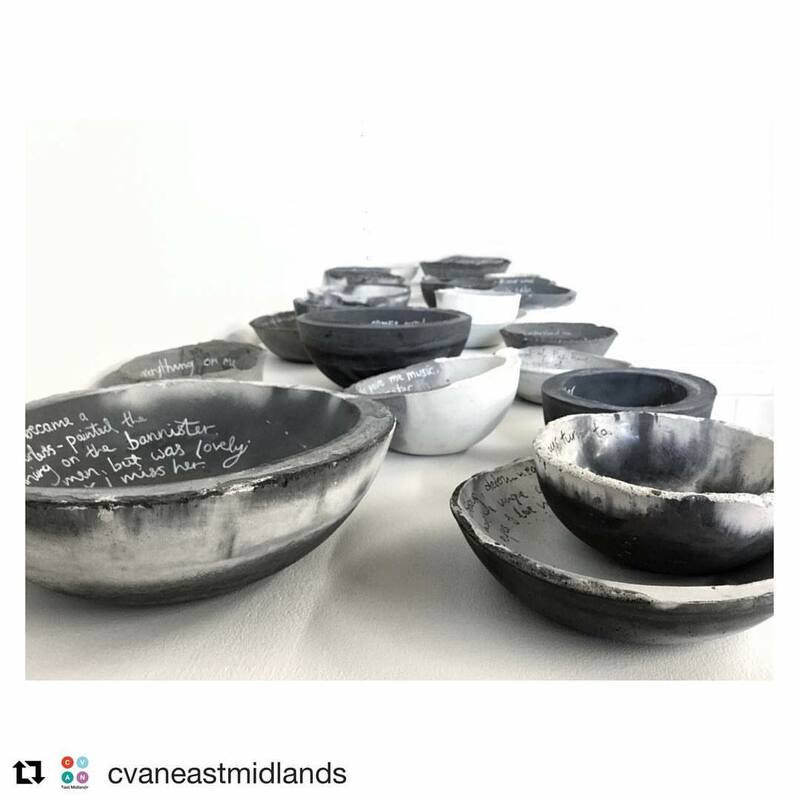 With the help of her bowls, Tracey ties the mess and variety of experiences with mothers together to a universal experience and turns it into a humble, beautiful work of stunning dimension. Intruiged and – I must admit – a little mystified about her and her work, I began to follow Tracey’s instagram which I want to recommend full-heartedly here. There she documents her work as an artist which includes her finished work and exhibition, as well as sketches, meetings with other artists, and visiting exhibtions – the whole lot. And next Friday, Tracey herself will have the opportunity to explain a bit more about how she creates work and how she sees her pieces herself when I get a chance to interview her. Nice post Hilke. The bowls look so appealing. To me they look like raku fired ceramics with the different shades of grey. I also think there is a kinship with your bottle project – artists reaching out in various ways to involve more people in their projects. Thanks, Judith. I felt a certain kinship with the bottles, yes. For me personally, the process of making a bottle and letting it go, has its parallels in the my relationship to my children. Having made something forms a bond, but I have to trust that it will fare well on its own outside in the world; there no sense in keeping it in my studio under supervision. But not much of this inner dialogue is present in the finished performance piece, I think. And thus Tracey is exploring the mother-child relationship in much different terms. But I do find it interesting that we both chose the form of a vessel. I talked with her a little bit about this, and she has some ideas why she chose this form. I am not going to repeat it as I will probably quote her wrong, maybe she wants to comment herself. To me it is a more intuitive thing that defies explanation in words.